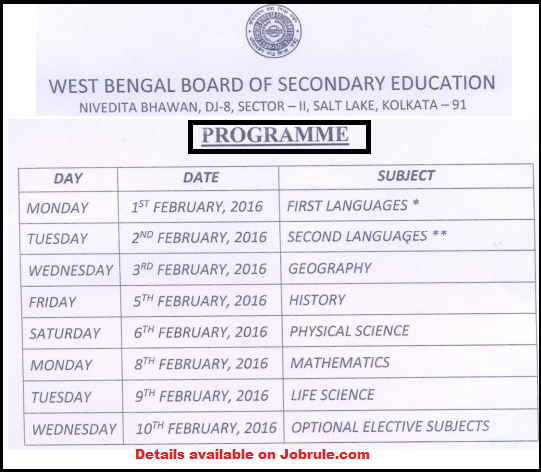 West Bengal Board of Secondary Education (WBBSE), Nivedita Bhawan, Salt Lake, Kolkata, published West Bengal Secondary Examination (Madhyamik Pariksha 2016 both regular and external) Routine/Program related notification (No-EMU/C/35 dt-5/6/2015) . 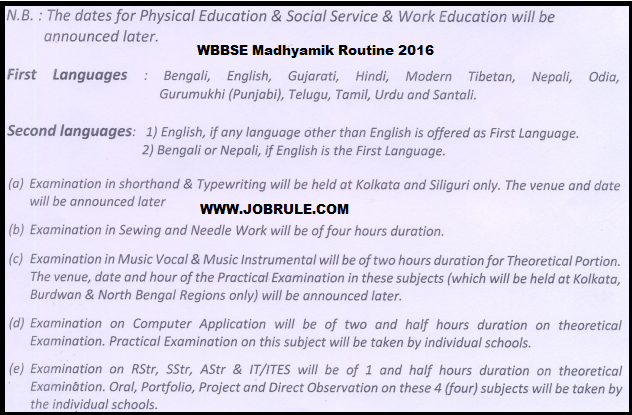 Paschim Banga Madhyamik Pariksha (Madhyamik Exam 2016) Routine/ Schedule Chart given below with instructions. N.B : The date of Physical Education and Social Service & Work Education will be announced later. 1. Examination in shorthand & Typewriting will be held at Kolkata & Siliguri only. The venue & Date will be announced later. 2. Examination in sewing and needle work will be of four hours duration . 3. Examination in music vocal & Music Instrumental will be of two hours duration for Theorital portion. The Venue, date and hour of the Practical examination in these subjects (which will be held at Kolkata, Burdwan & North Bengal regions only) will be announced later. ractical Exami9nation on this subjects will be taken by individual school. We are not official website of WBBSE. We collect information from WBBSE official web portal to help common students and gurdians. We are not responsible for future changes. So, you are requested to visit WBBSE official website regulary for latest updates . Best of Luck ! 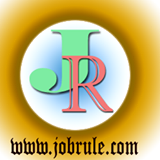 Like our Jobrule Facebook Page to get online Madhyamik Suggestion 2016.